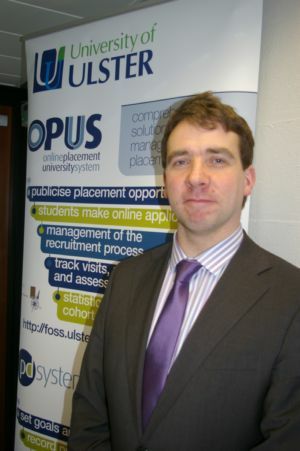 Colin Turner is a dedicated Free Software activist and Fellowship member, working as a scientist and teacher at the University of Ulster in Northern Ireland. He has been advocating Free Software in schools and universities for many years and generously shared some of his experiences with us in this fourth instalment of our Fellowship interview series. Stian Rødven Eide: You are a Doctor of Mathematics, working as a senior lecturer and researcher at the University of Ulster. Has the growing availability of Free Software helped furthering the field of mathematics? Colin Turner: Not as much as it should have. By far and away the most popular packages in the field are proprietary, things like Mathematica, Mathcad, and so on. There are free alternatives, but these are often perceived to be weaker (and this is generally, unfortunately, true), and the free alternatives like Axiom and Maxima seem to be less well rounded. It’s harder to get students to learn them. On the other hand, things like LaTeX are a huge part of the maths education world, and excellent Free Software that is hard to beat. We keep trying to show the virtues of using Free Software in both teaching and research. SRE: Can using Free Software help people become better mathematicians? Colin Turner: I’m not sure it particularly has that effect, it’s just that there are practical consequences to using free software that are generally helpful. For example, your research project doesn’t go belly up just because a proprietary firm stops making a product. It could be argued that the nature of software like LaTeX and R promotes better understanding however. SRE: You have also been involved in research on medical applications. Does Free Software play an important role in the world of medical technology? Colin Turner: That is increasing. There is still a lot of Free Software being used by the research community. For example, R is a great way of analysing research data in a far more powerful way than many proprietary tools can. One of the big gaps is the sharing of created code. That is, researchers are quite used to sharing data and ideas, and sometimes even algorithms in papers, but usually not code. As a result, a PhD student or another research team ends up having to reimplement code from description of an existing algorithm before they can push a project forward. This is a waste of time and resources. In my field, where the applications are medical, it wastes an opportunity to try and help people’s lives in a direct way quicker. SRE: You are a devoted advocate for Free Software in education and have given several talks on the subject. Which arguments do you find most effective in convincing schools and universities to start using and developing Free Software? Colin Turner: I have generally started at the other end, realising that there is a specific and pernicious bias against Free Software. So it’s not a level playing field. It’s useful then to explore the myths that people present to avoid using Free Software, that it’s poor quality, that you can’t get support and so on. One of the most serious, hidden issues, is that the “cheaper” tag is a mixed blessing. For the Free Software advocates it often misses the point, but it is appealing (apparently) to purchasers. However, you will discover many people argue that Free Software has a much higher total cost of ownership (with little or no evidence). My firm belief is that saving money is not only not a priority for some departments in large institutions, it is a problem. It leads to a reduced budget and hence perceived power. So I address these issues one by one. I point out Free Software is, like all software, of varying quality, but at least it is peer reviewed, and many such projects are reviewed many times. For instance, to take Mozilla Firefox as a well known brand, obviously Mozilla has their own strict QA measures, but unlike in the proprietary world there are additional levels, so for example Firefox being packaged for a GNU/Linux distribution gains another level of QA from that. The support issue is easy to neutralise. One of our university’s own spin out companies, Synergy Learning, provides consultancy for Moodle. There are a lot more examples. I point out that this makes Free Software more sustainable. The budget issue is hard to address, as it is often hidden, but public sector bodies should be encouraged in such ways that they can redeploy budget they save on software procurement. Incidentally, in the UK there is an obligation laid down by the OGC that looks at procurement to consider FOSS alternatives. This is often ignored, but it’s useful to remind the public sector bodies of this. I’ve made these points to the Civil Service here in Northern Ireland where I was invited to speak. So you see there is at least an expanding awareness of the issues. SRE: Are students generally more inclined to get involved with Free Software than the institutions themselves? Colin Turner: Some are. But actually most students are totally unaware of the issues of Free Software, and the broader concerns such as the ethics, business models and impact on society. It is my firm belief that all students educated in software should be taught about these issues, as well as the issues surrounding copyright, patents and DRM. We need that generation to be well informed. You usually find that the students who have been exposed to these ideas by advocating staff members are far more inclined to use Free Software. It’s a real struggle to get institutions to consider a Free Software deployment. One reason which is hard to counter is the “gaps”. An institution rolling out a software platform (Operating System + Applications) essentially wants a single image they imprint in thousands of machines. If there is just one program that staff want that doesn’t have an equivalent free alternative (e.g. some CAD applications) then there is no apparent incentive to them to install a free OS and other applications. My solution is that universities should use their huge numbers of students seeking software projects to help fill these gaps. This is another reason that educating the students about the issues is so important. SRE: One of your most prominent software projects is the OPUS Placement Management system, designed to facilitate placement operations for a school, college or university. In 2006 this was released as Free Software by the University of Ulster. Were there any difficulties involved in releasing the project under a free licence? Colin Turner: The release under a free licence came rather late in the process. Up to that point, it was a custom internal project. I developed OPUS in addition to my regular duties, but hadn’t thought to stick a GPL licence on it at the very start. I know better now. But anyway, I developed it in my own time, so the idea of ownership was a grey area, sure I was developing it as an agent of the university, but at the same time it was extra curricular so to speak. I felt this strengthened my position since the university could then accept the code as a gift and there’d be no tussle for ownership. But this wasn’t my main argument. The software was demonstrated over many years in many countries, and always the same question came back “Can we buy it?”. I found it frustrating that we were sharing good practice with other institutions but not code. They would have to reimplement it. I argued to the top of our university that we would be sharing our national and international leading practice by sharing the software and making it free. That we would provide barriers to adoption by trying to sell it as a proprietary project, and that freeing it was a simple and effective exploitation strategy. In other words, the university realised that this was really the most effective way to leverage the product, the reputation it would give them, at very low risk. It worked, the product has been demonstrated on every continent now, and is widely admired. It gives the university a lot of good publicity. I also argued that it made the product more sustainable, by allowing multiple centres of expertise in developing it to grow, sharing code as well as experience. Incidentally, we made a sister product, the PDSystem which deals with Personal Development Planning, free at the same time, and these precedents have made it easier to continue freeing other smaller projects we are and will be working on. SRE: OPUS has been adopted by many other institutions from all over the world. Has this helped the further development of the software, according to the principles of the Bazaar model, or does most of the progress happen within the University of Ulster? Colin Turner: At the moment, most development still happens here in Ulster, but the Bazaar model is still our preferred outcome. In other words I think that will grow with time when other institutions gain deeper understanding of the codebase and have substantial changes to effect. At the least, we have all our bug and support trackers completely in the open. That has been hugely helpful, both internal and external stakeholders can really give much more direct feedback on the project than is normal for a university product where lots of committee reporting is the norm. At least, we are seeing that the number of developers within Ulster able to contribute is increasing, and I expect more from others in the next year or so. SRE: With the release of OPUS, you decided to create your own hosting site, FOSS@Ulster, which also hosts several student projects. Do you find that the Bazaar model of development is important and/or helpful for students to have experience with? Colin Turner: Yes. I decided that as a major argument was to raise visibility of the university’s efforts, a hosting environment within the university made sense rather than having them lost in a big site somewhere else. It was a concious decision to throw the gauntlet down to other developers in the university to consider following suit, and also to provide the tools for the job. I selected Savane as the hosting software. I agree with the Debian philosophy “we will not hide our problems” and think that there is much to be learnt from the dynamic of the open development process itself. I have encouraged final year students to put their individual projects on-line in this way. This year, I will be insisting that my final year Object Oriented Programming students do their group projects on FOSS. They are scared of the tool set, but I really want to show them that once they get their heads round them they really simplify multi-developer projects. Again, exposure to the working tools of the Free Software community is sadly lacking in traditional computing degrees. SRE: In 2008, you were involved as an organiser and speaker at OpenIsland, a Free Software conference for Ireland and Northern Ireland. How do you regard the current climate for Free Software in the two countries, compared to for example the Netherlands and Norway which both have public policies encouraging adoption of Free Software and Open Standards? Colin Turner: We are still a bit behind that curve of leading countries, but I perceive a slow but serious shift in position. As Bruce Perens said at the conference, it’s getting to be that having governmental representation at such conferences by ministers (in the case of OpenIsland Sir Reg Empey gave a speech) is no longer unusual. At events subsequent to this, such as the launch of the Open Source Solution Centre in the Southern Regional College here, speeches made by ministers are showing that they really understand the issues, and that in particular small countries like Northern Ireland have a lot to gain from the agility of the Free Software model. The very fact the Northern Ireland Civil Service asked for a talk shows that there is expanding awareness in the public sector. The situation is similar in the Republic of Ireland, but due to their very different corporate tax environment they have a lot more of the “big” software companies there, so the small “agile” model probably looks less relevant to them. Nevertheless, there is now an awareness that virtually no software company doesn’t touch the Free Software world at some point; it’s an issue that can no longer be ignored. There are still significant issues in reducing ignorance leading to poor procurement decisions, but that awareness, coupled with aggressive “mythbusting” is slowly turning the tide. Many thanks to Colin for sharing his thoughts and experiences with us. You can discover more of his endeavours at his homepage and his blog, Proving the Obviously Untrue. This entry was posted in fellowship, free software, interview by julipan. Bookmark the permalink.